In the entrance of Japanese houses, there will definitely be a shoe box. In the past, Japanese used to wear geta a lot so even now many people call this a “getabako” (“box for geta”). In Japan there are more and more places where you can enter and keep your shoes on like offices, hospitals, shops and so on. But many establishments remain, such as schools or some restaurants, where we have to take off our shoes and put them inside the shoe rack. 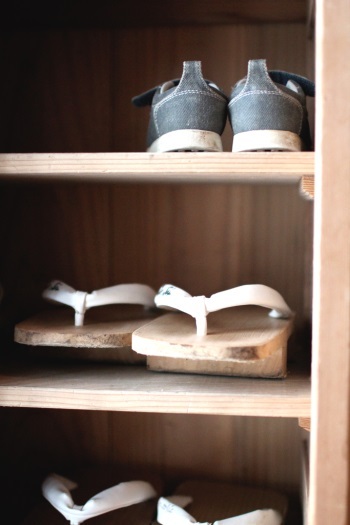 We have the custom of taking off our shoes when entering inside a house, so we care a lot about the smell of our feet. Especially during the winter season, when we remove in front of everybody some boots we’ve been wearing for a long time, we worry that our feet might be stinky. When I visited my husband parents’ house in France, people of course entered the house with their shoes on and there was no shoe box in the entrance. So I put the shoes I brought all the way back from Japan in my room. In such a case, I think the system where you have a shoe box in the entrance from which you can choose the shoes you like before going out is really good. There are times when I don’t want to expose smelly feet in public, but I think a shoe box in the entrance is very useful.